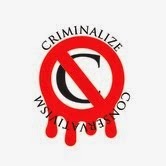 Criminalize Conservatism: What Happens When We Mix Crazy, Evil, And Stupid? 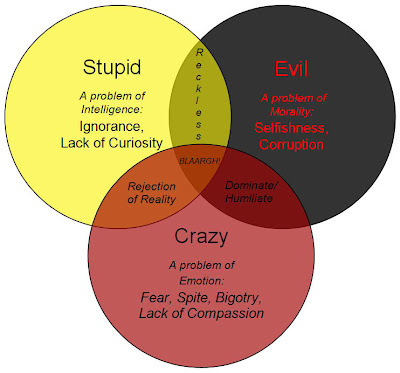 What Happens When We Mix Crazy, Evil, And Stupid? The short answer is that we get a Conservative. "Can Science Explain the Rage, Reality-Denying and Distorted Thinking Patterns of Tea Party Radicals?" "Liberals have had their suspicions about the source of all the rage and anger regarding the Tea Party Movement, but can social science finally lend some credence to them? According to author and journalist Chris Mooney, it can. "Mooney sat down with Moyers & Company to discuss the seething rage and anger at the core of the hard right-wing movement, and how they differ in a sociological perspective from the rest of us. One of the most basic differences appears to be that conservatives in general but hard right-wingers in specific have a very different moral compass form the rest of us. "'Harm' is just one of seven different morality types; the other six include 'Fairness,' 'ingroup,' 'authority,' 'purity,' 'economic liberty,' and 'lifestyle liberty.' (Above) is a graph comparing the three different identifications in this country — liberal, conservative, libertarian — charted out to show the responses in regards to the different morality foundation..."
But isn't hate kind of crazy, you ask? "There’s no gentle way to put it: People who give in to racism and prejudice may simply be dumb…Low-intelligence adults tend to gravitate toward socially conservative ideologies. Those ideologies, in turn, stress hierarchy and resistance to change, attitudes that can contribute to prejudice." There are times when evil, crazy, stupidity seems funny...until you realize that some of them are in charge. Conservative leaders aren't all that crazy, except for the Tea Baggers that are still running around loose. But Conservatism has always been evil. "What a terrible thing to have lost one’s mind. Or not to have a mind at all.